In TENNESSEE, famed United States Senator and long-time Governor of Louisiana, Henry JOHNSON, will be born later To-day. Smaller Items Of News Worthy-ness, Or, Bulletins, AS THEY ARE SOME TIMES KNOWN. An Other Family Spends Quiet Evening Gathered Around Oil Painting. 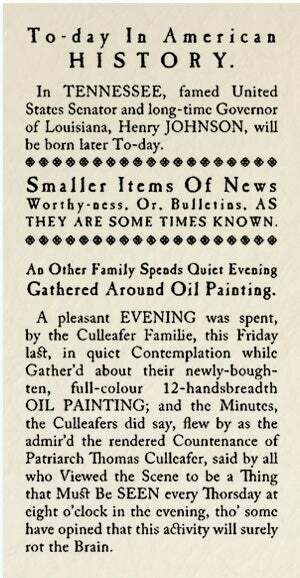 A pleasant EVENING was spent, by the Culleafer Familie, this Friday last, in quiet Contemplation while Gather'd about their newly-boughten, full-colour 12-handsbreadth OIL PAINTING; and the Minutes, the Culleafers did say, flew by as the admir'd the rendered Countenance of Patriarch Thomas Culleafer, said by all who Viewed the Scene to be a Thing that Must Be SEEN every Thorsday at eight o'clock in the evening, tho' some have opined that this activity will surely rot the Brain.